Schroon Lake; Christa G. Ocker, nee Holder passed away at her home Saturday November 5, 2016. Christa was born January 5, 1938 to Anna and Martin Holder in Gorlitz, Germany. Christa, with her mother and sister and thousands of others, fled the Russian occupation zone in eastern Germany during the final months of World War II. When the war ended, the family was reunited with her father and settled temporarily in Osterrode, in the American occupation zone, then immigrated to Nichols, NY in 1951. She graduated from Nichols High School in 1955, then moved to Queens, NY with her sister Rosalie and began work for TWA at LaGuardia Airport. Christa was an avid skier until recent years; she met her husband of 59 years, Ralph in the German Ski Club of New York, and raised a family of four children in Emerson, then Hillsdale, New Jersey. 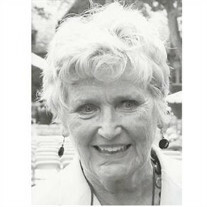 In Hillsdale she was an enthusiastic and dedicated member of the Hillsdale Volunteer Ambulance Corps for over twenty five years. She was the legal guardian, for a time, to her beloved niece Karen Ocker. Christa took an interest in writing short stories and poetry, publishing her first prose in 1997, "A Crow Named Robin" published by Toy Box Press. Her short stories subsequently appeared in Chicken Soup for the Soul, Chicken Soup for the Kid's Soul, Devotional Stories for Tough Times, and numerous other series. She also collaborated with artists Kevin McVey and Ann Gregson to render several of her stories into illustrated children's books. "Merry Christmas, My Friend" was adapted for television. Christa's main character was played by Mickey Rooney. A memoir of her experiences as a girl witnessing the Nazi ruination of Germany during World War II, called Auf Wiedersehen: World War II through the eyes of a German Girl, was published by Plain View Press in 2009. Christa loved the Hudson River and resided on its banks in Newburgh, NY from 2008 until she moved to Schroon Lake permanently in 2015 where she was grateful to know the warm welcome of a new group of friends. When she was diagnosed with advanced cancer in January, she resolved to conclude her life with the lake, the forests, loons, and eagles nearby. Christa enjoyed sailing with her husband in the Society for the Education of American Sailors at various destinations around the world, participating in the lives of her grandchildren, collaborating with friends in several writers' groups, and marveling at nature's bounty. She is predeceased by her parents, her son Peter, and her sister Rosalie. She is survived by her husband Ralph, her children Christopher, Barbara and Arthur John and twelve grandchildren and one great grandchild. A Mass of Christian Burial will be celebrated at 11:00 AM on Friday November 11, 2016 at Our Lady of Lourdes Catholic Church in Schroon Lake. Interment will be at the convenience of the family. A celebration of Christa's life will take place at a future date.